For our school project "Flycar" we wanted to get a model car (283 x 95 x 90 mm, approx. 400 g) to levitate with the help of magnets that reject each other. First, we tried to make the car levitate by itself by placing magnets underneath. But soon we realized that this will not lead to a steady levitation and the car will constantly be pushed to the side and crash down. 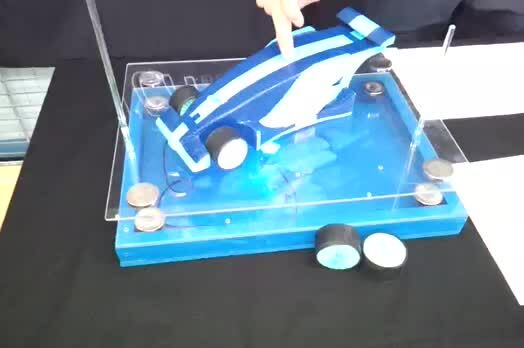 Then we had the idea of placing the car on a Plexiglas board that has magnets embedded. We countersunk a disc magnet S-35-05-N in each corner of the board. Under the table we placed an identical Plexiglas board with the same magnets. In order for the top board to levitate steadily above the bottom one, we drilled a hole at the front and the back of each board and connected them with long enough sticks. 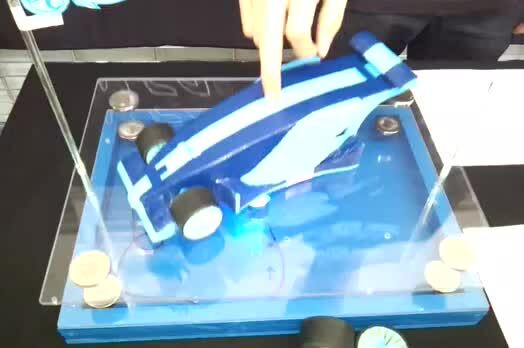 The video shows that the top board levitates approx. 4 cm above the bottom one. We did it - we got the car to "fly"!